Stuart Cove’s continues to strive for outstanding customer service and provide one of the most complete and modern dive centers in the world. Stuart Cove’s Dive Bahamas is the largest full service dive operator on the island of New Providence. The operation has a fleet of 8 boats, 5 of which are over 40 feet in length and are custom dive boats. The Dive Bahamas facility is truly a state of the art dive center. 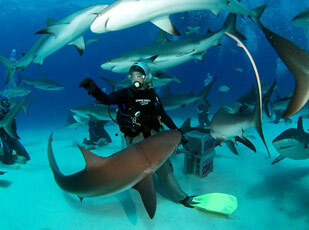 The feature activity for divers at Stuart Cove’s is the “Extreme Shark Adventure”.